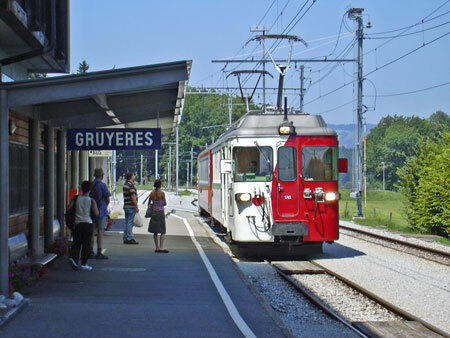 This page shows postcards and images of la Gruyère which operates metre and standard gauge railways in the Swiss canton of Fribourg. 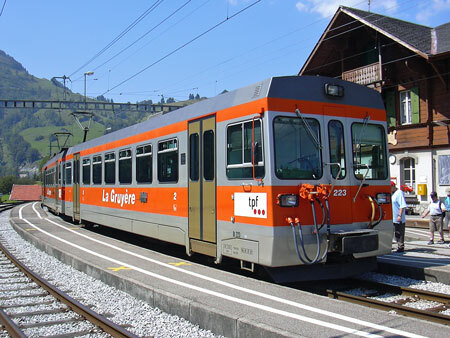 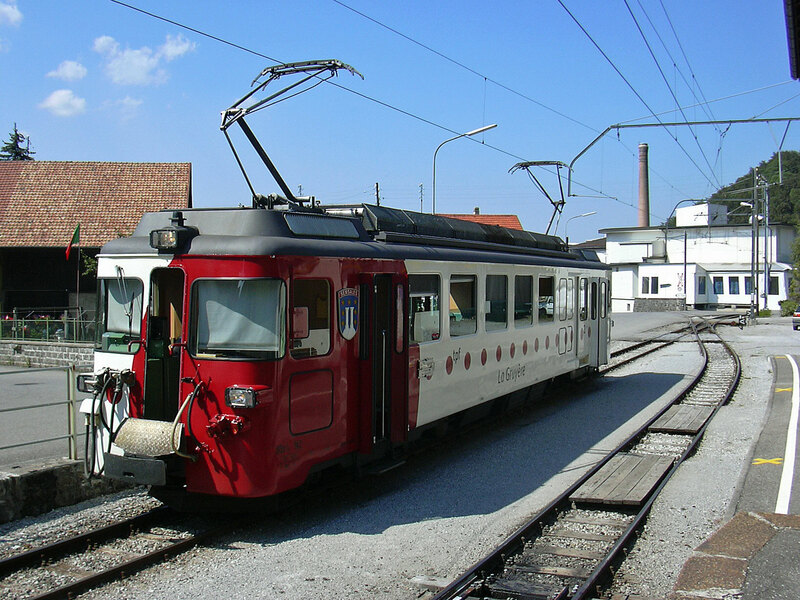 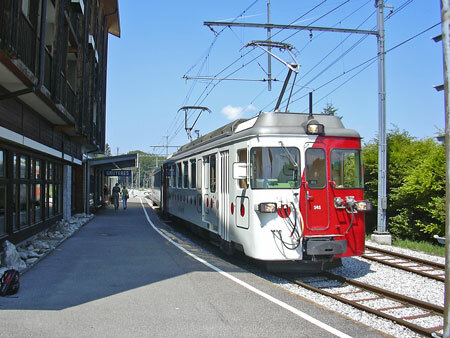 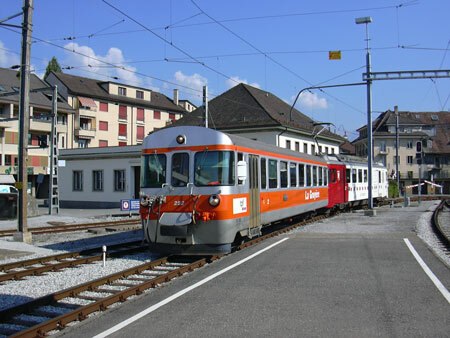 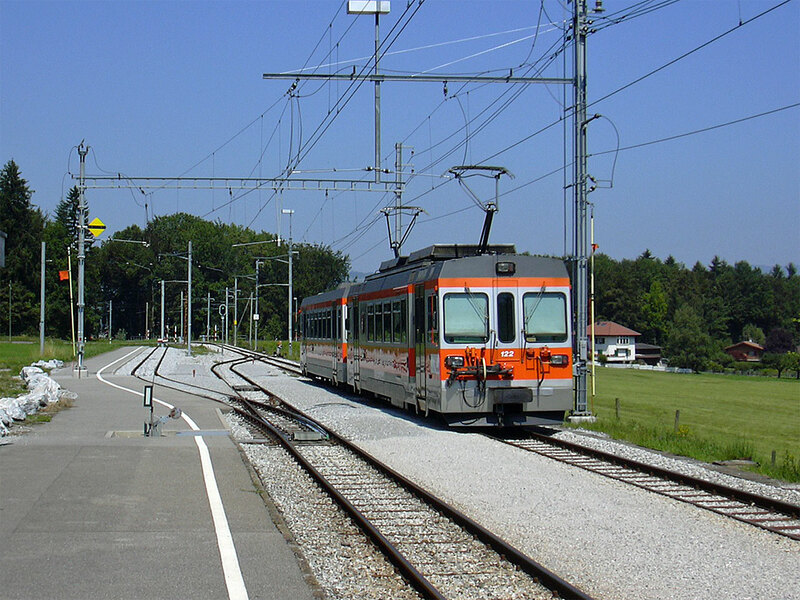 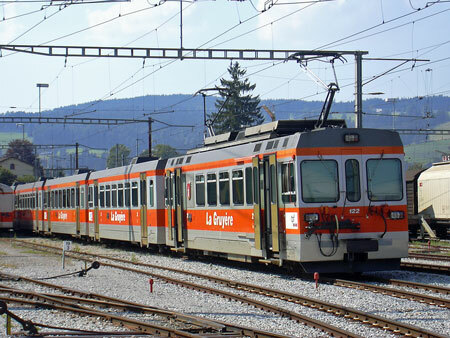 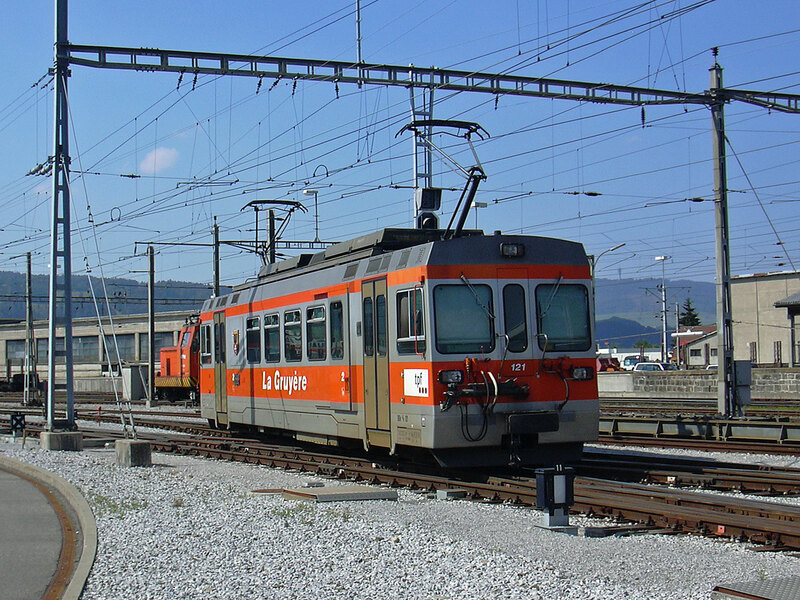 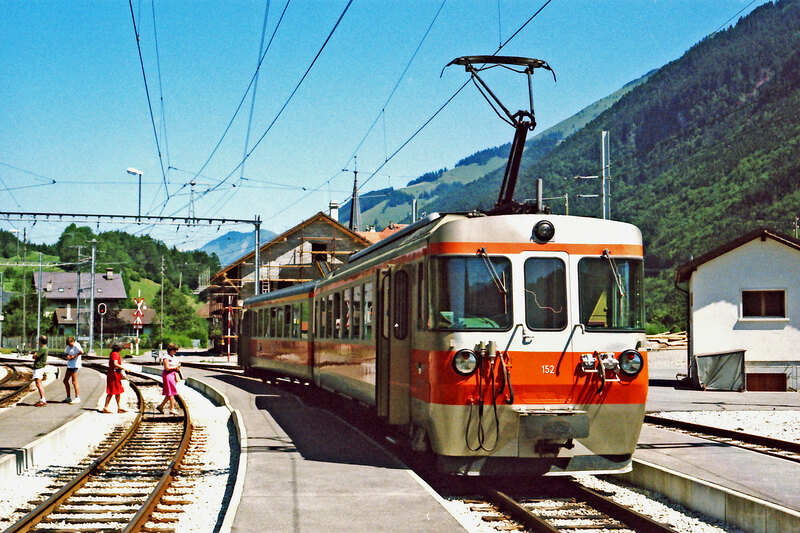 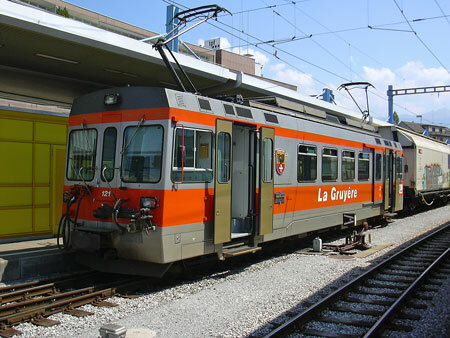 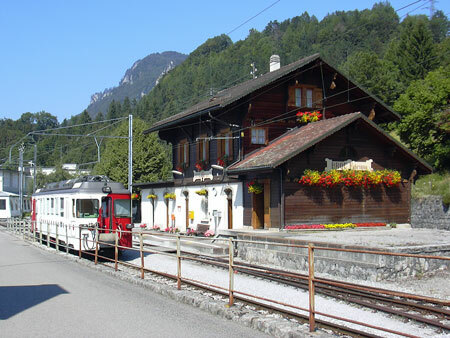 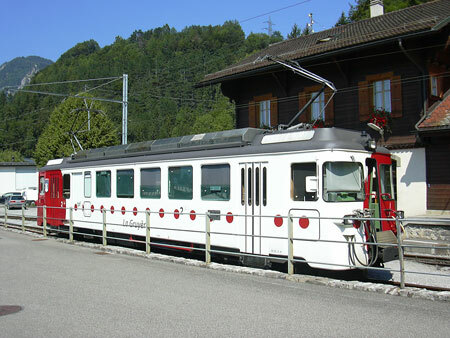 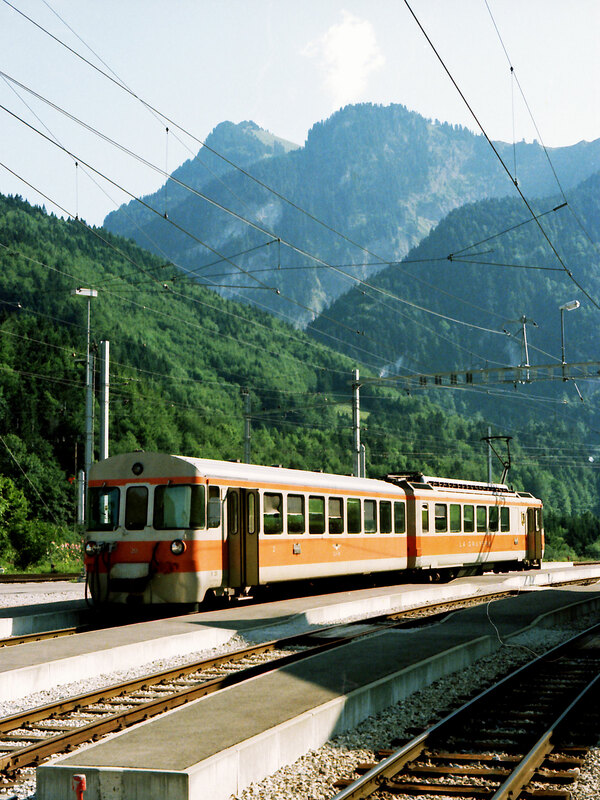 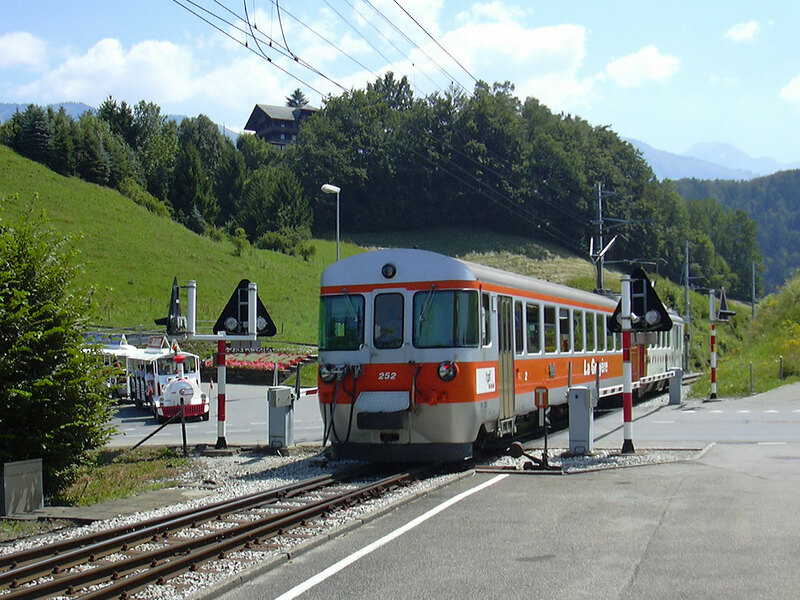 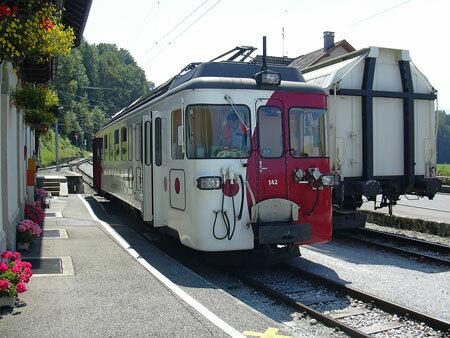 The main line of the narrow gauge network runs from Palézieux, on the SBB main line from Bern to Lausanne, via Châtel-St-Denis and Bulle to Montbovon and has a total length of 44.2 km. 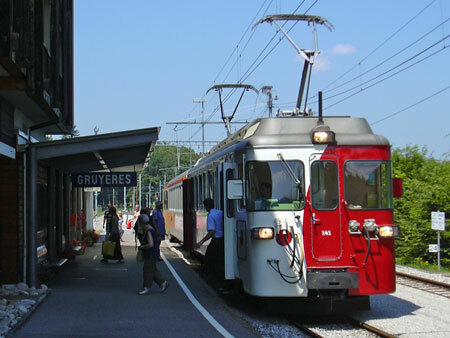 The short Bulle-Broc branch, which was opened for traffic in 1912, leaves the main line just before La Tour-de-Trême station and serves the nearby Nestlé chocolate factory (previously Cailler), as well as the village of Broc. 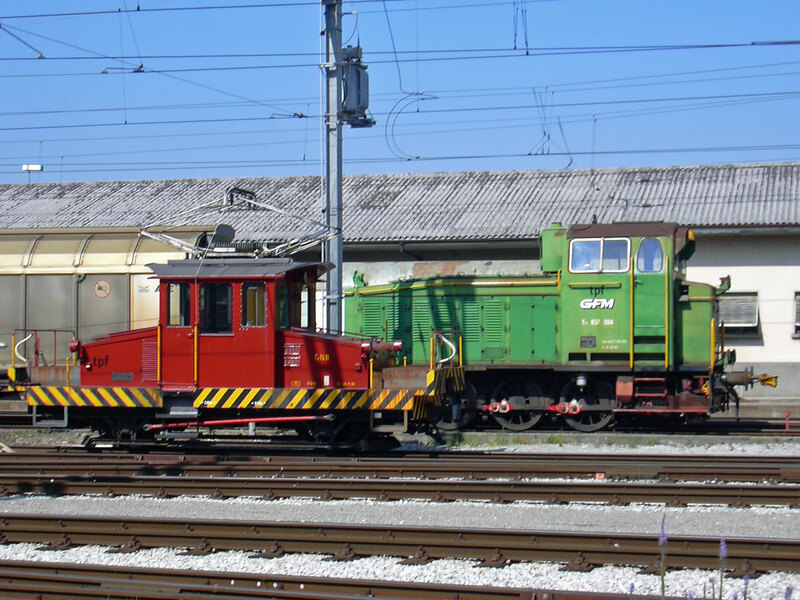 There is talk (in 2014) of converting the Broc branch to standard gauge. 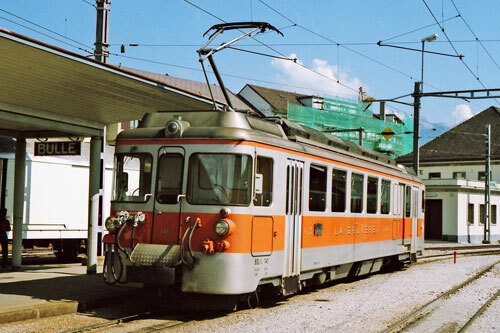 The system was opened in stages, that from Châtel-St-Denis to Palézieux (CP) in 1901, then over the following three years by the lines which made up the Chemins de fer électriques de la Gruyère (CEG), originally named CBM, those from Châtel-St-Denis to Vaudens, Vaudens to Bulle, Bulle to La Tour-de-Trême and from La Tour-de-Trême to Montbovon. 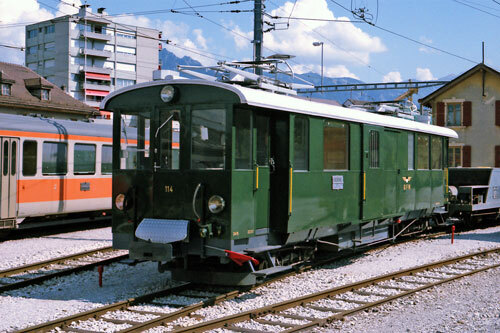 From 20 December 1907 the CP was absorbed into CEG, and the branch line to Broc being added in 1912. Soon the company extended its activity into the bus sector and built up a large network. From 1 January 1942, and with the addition of two standard gauge lines, Bulle-Romont and Fribourg-Murten- ns, they formed the Chemins de fer Fribourgeois, Gruyère-Fribourg-Morat (GFM). 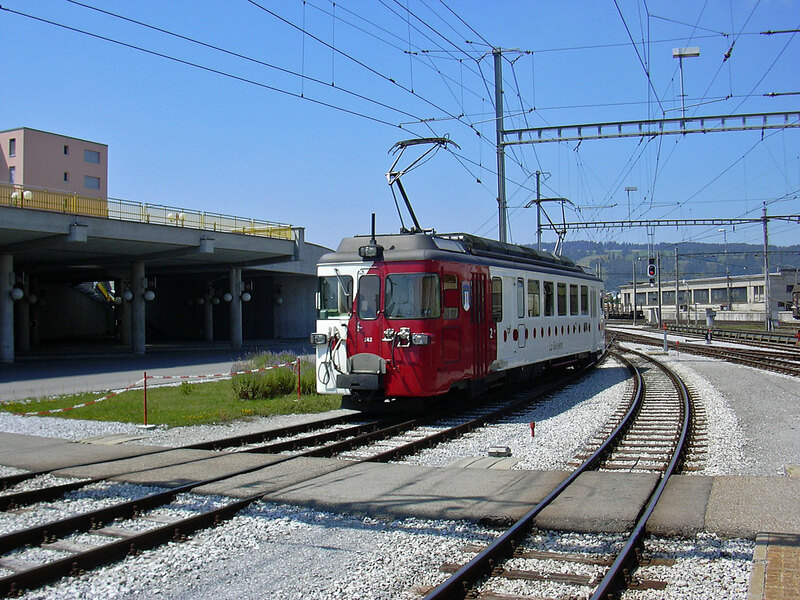 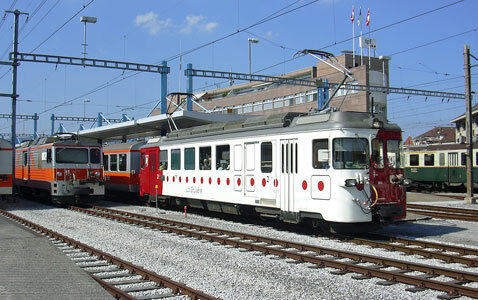 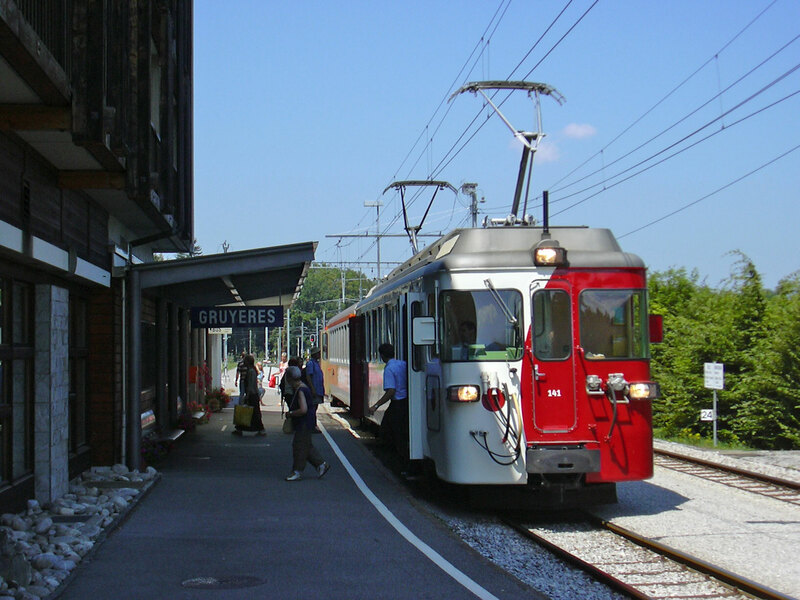 Bulle is the centre of operations with depot, workshops and, within its modern station, the connection between the metre and standard gauge lines as well as many bus routes. 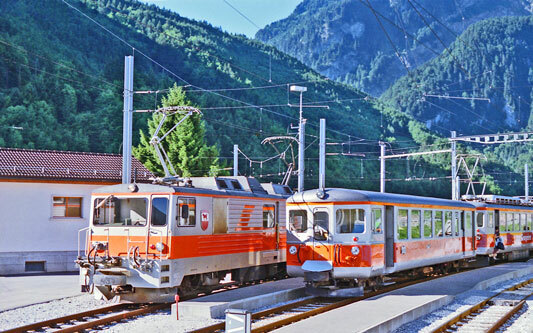 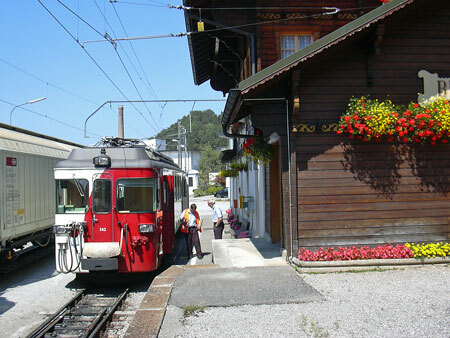 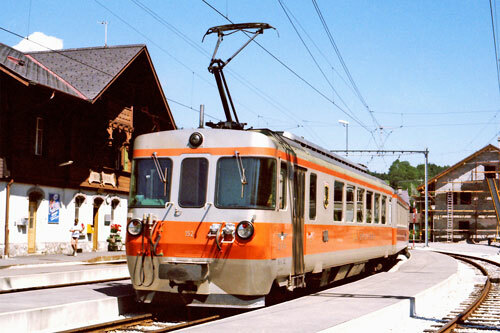 Transfer to the trains of the Montreux-Oberland Bernois takes place in Montbovon, and until 1969, Châtel-St-Denis was also reached by a line of the CEV from Vevey. 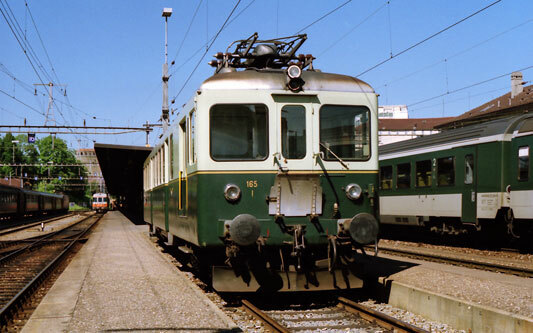 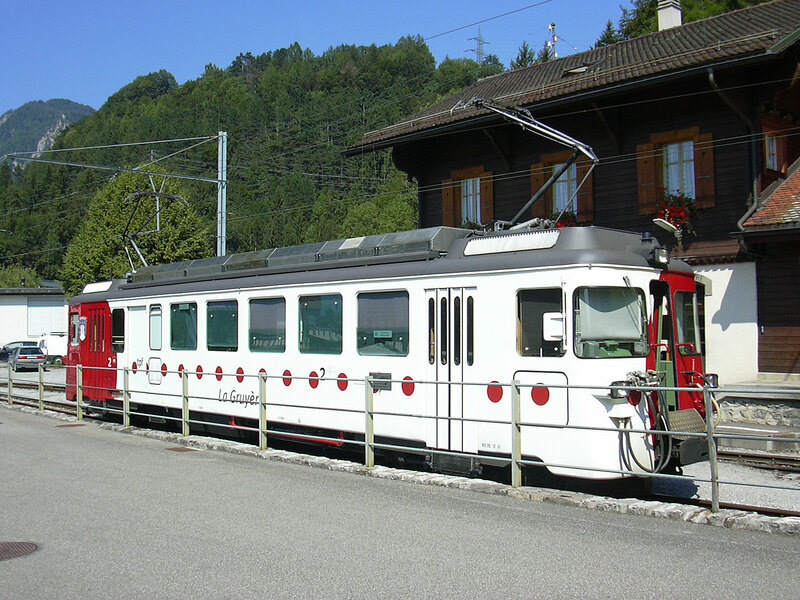 Railcars were the chosen motive power from the early days in the main due to the reversal of trains at Châtel-St. Denis, and this has continued with rebuilt or new modern units, working as single cars or in multiple. In 2000 the company was renamed Transports publics Fribourgeois SA (Freiburgische Verkehrsbetriebe AG) and the city of Fribourg motor bus and trolley bus routes were integrated. 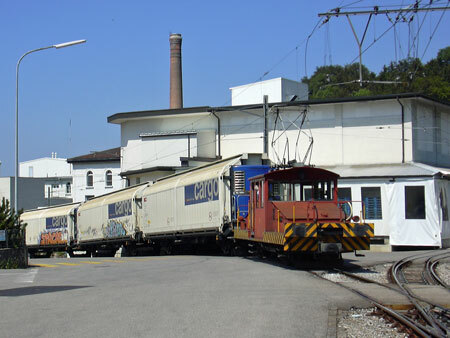 Since 1958 goods traffic, much of which is shipped onwards by the standard gauge, has been carried by a "piggy back" system where the standard gauge wagons are transported on carrier trucks. In 2004 the Nestlé factory at Broc Fabrique generated over 1500 wagonloads over the system. From December 2006 the TPF handed its freight traffic to the CFF/SBB/FFS and its two locomotives, numbers 101 and 102 became surplus to requirements. In April 2007 they were sold to the MOB, who ran identical locos. 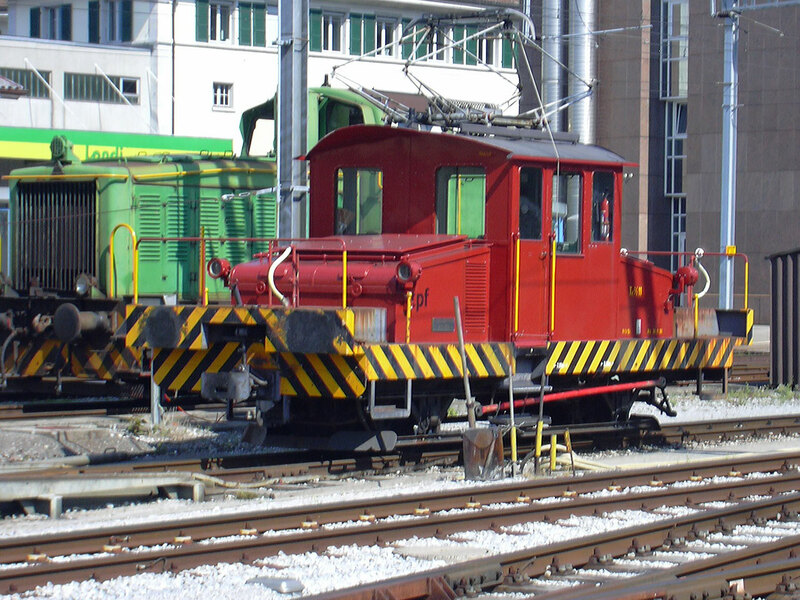 GFM/TPF No.11 was built in 1913 by MFO (Oerlikon) and was being used at Bulle for shunting standard gauge wagon on transporters, hence her oversized buffer beams. 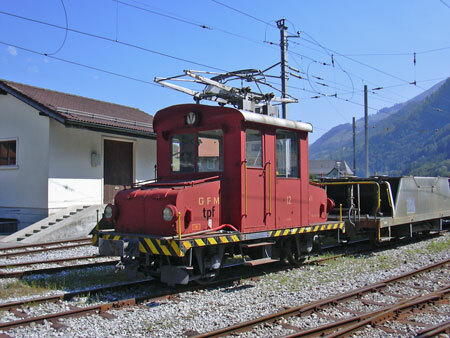 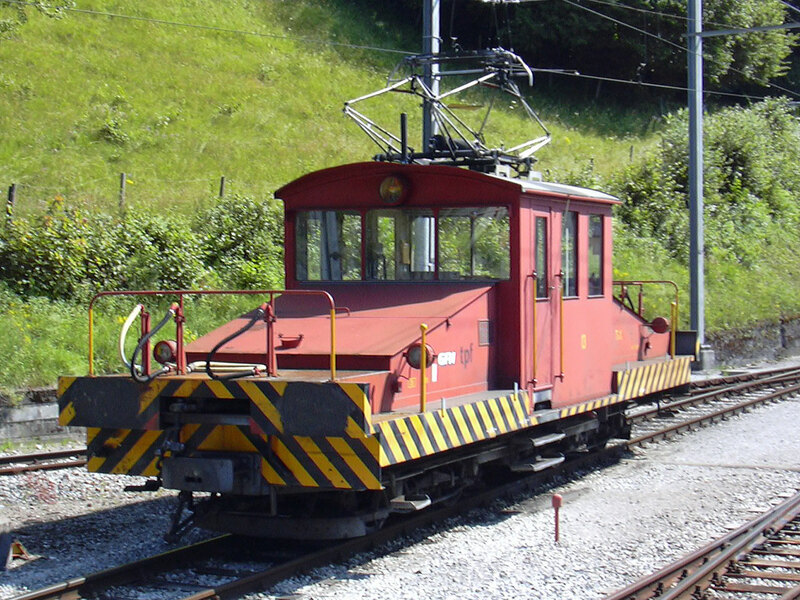 GFM/TPF No.12 was built in 1913 by the railway (then the Chemins de fer Électriques de la Gruyère (CEG)) with Alioth (later BBC) equipment and was working at Montbovon. 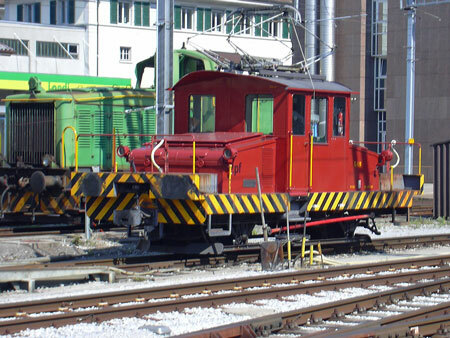 Unlike 11 & 13, she is not fitted with beams to work standard gauge wagons. 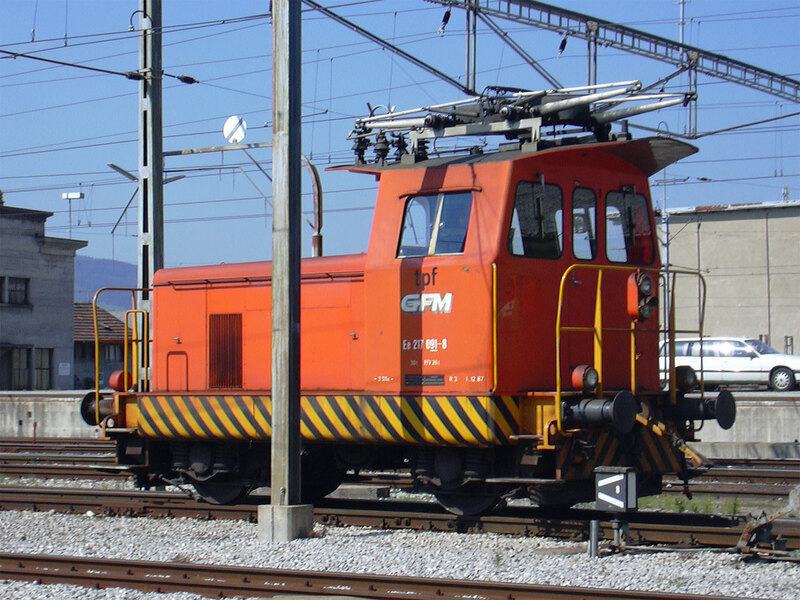 GFM/TPF Nos.101/102 were built in 1983 by SLM/BBC to work freight trains. 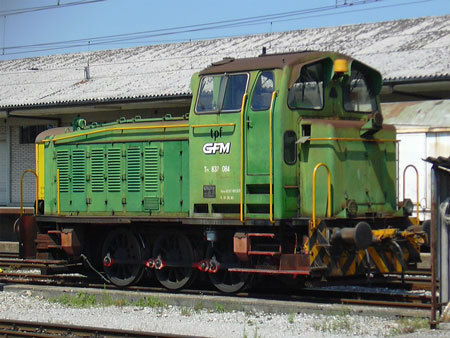 There are the same design as MOB Nos.6001-6004, but whereas the MOB locos hauled heavy express trains over a lengthy and hilly route, the GFM locos hauled fairly light freights on a much less arduous route. Somebody very persuasive must have put through the justification for these massive locos (by light railway standards). 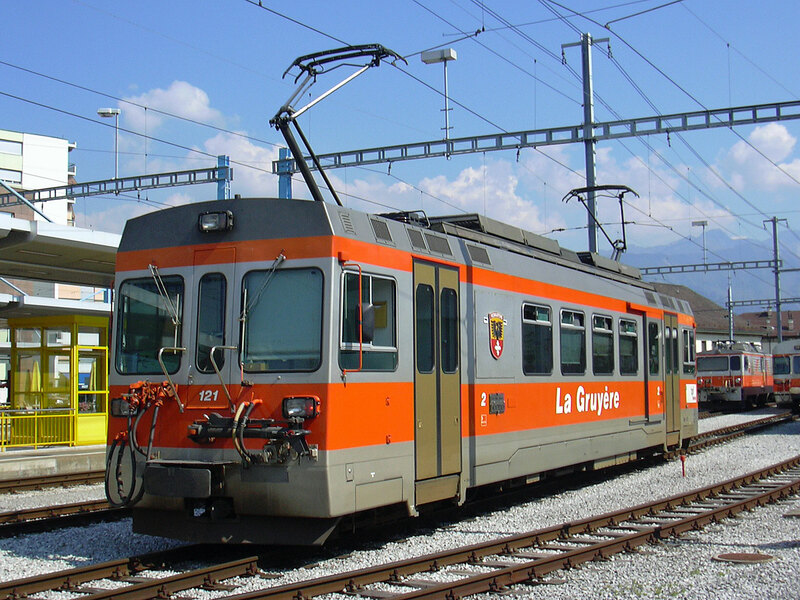 In the event, they were sold to the MOB in 2007, becoming 6005 and 6006, but retaining their names. 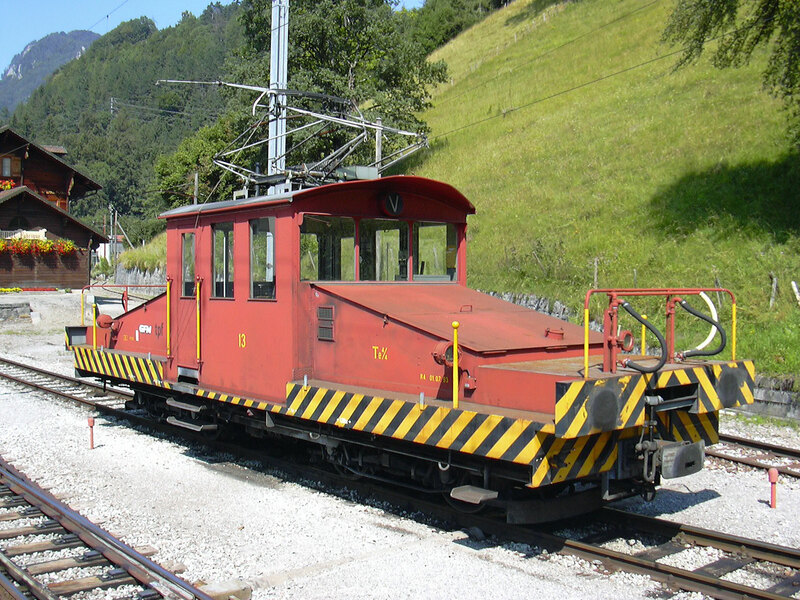 GFM/TPF No.111 was built in 1903 by the Schweizer Waggons und Aufzuegefabrik AG, Schlieren, with electrical equipment by Alioth (now BBC). 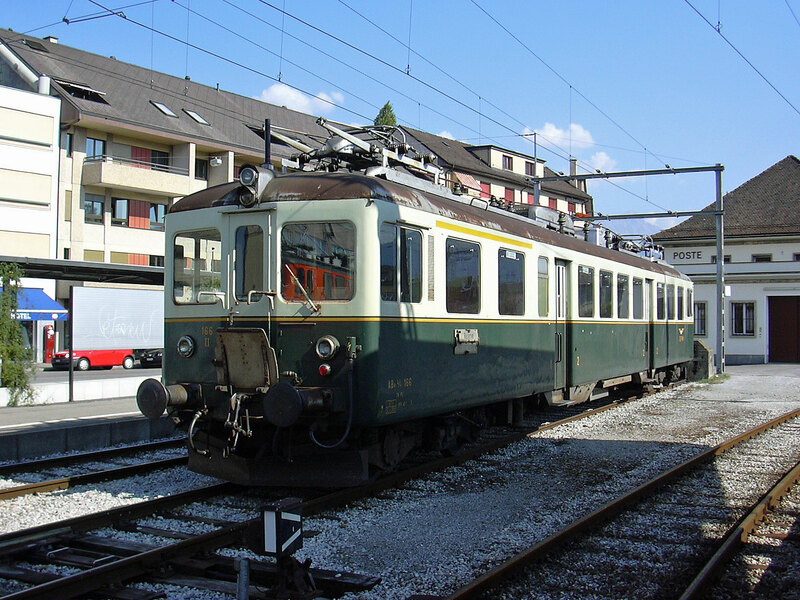 No.111 was rebuilt in 1968 with more modern ends and windows. 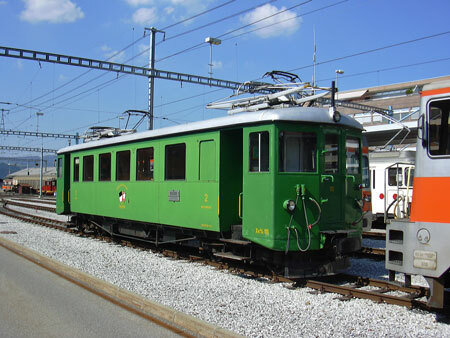 Fully restored and looking magnificent at Bulle below, but later moved to the Blonay-Chamby preserved line. 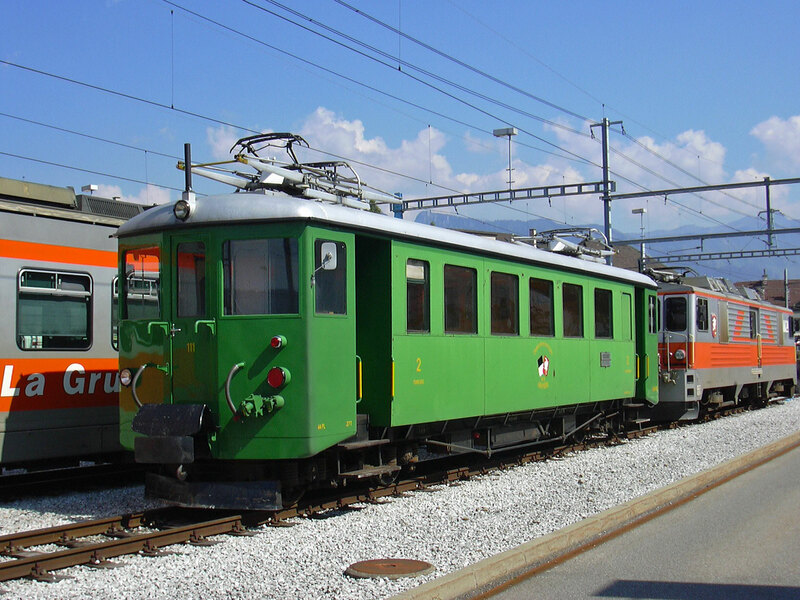 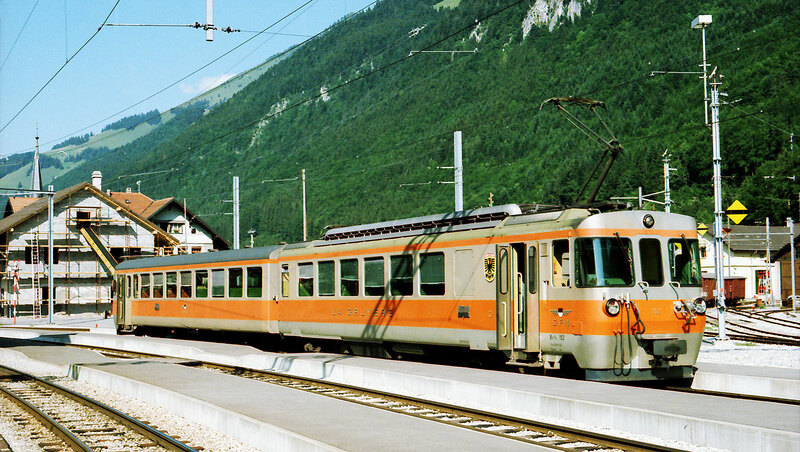 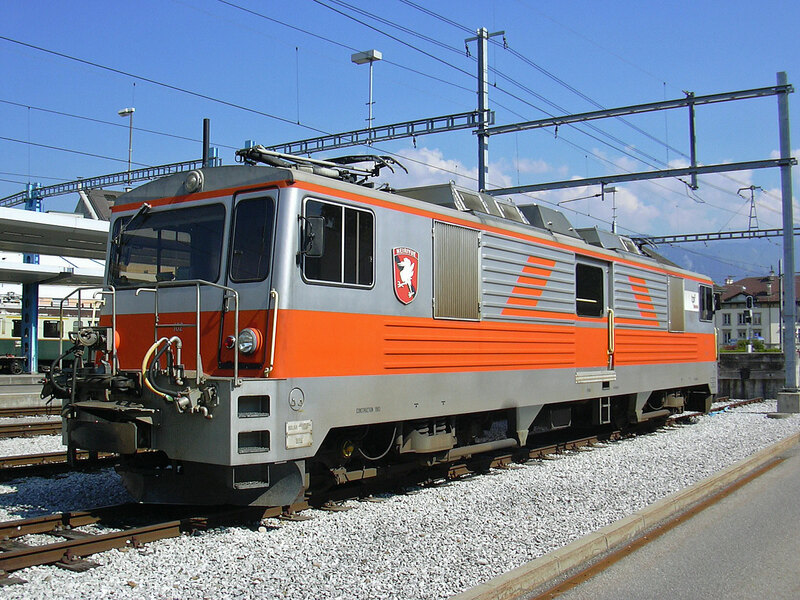 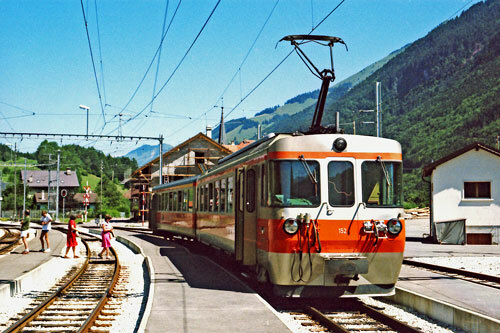 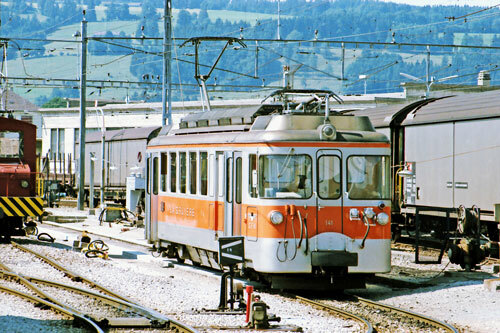 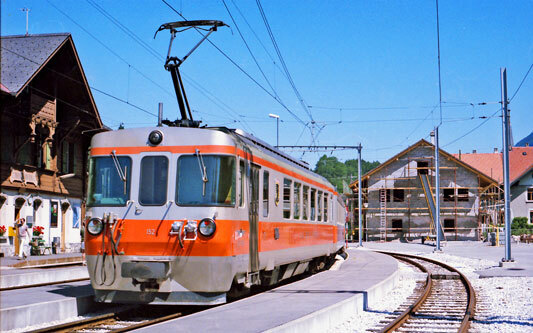 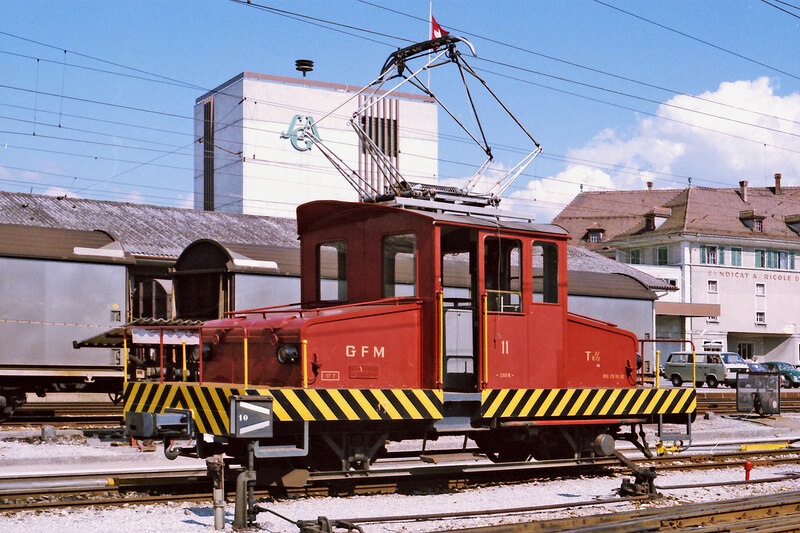 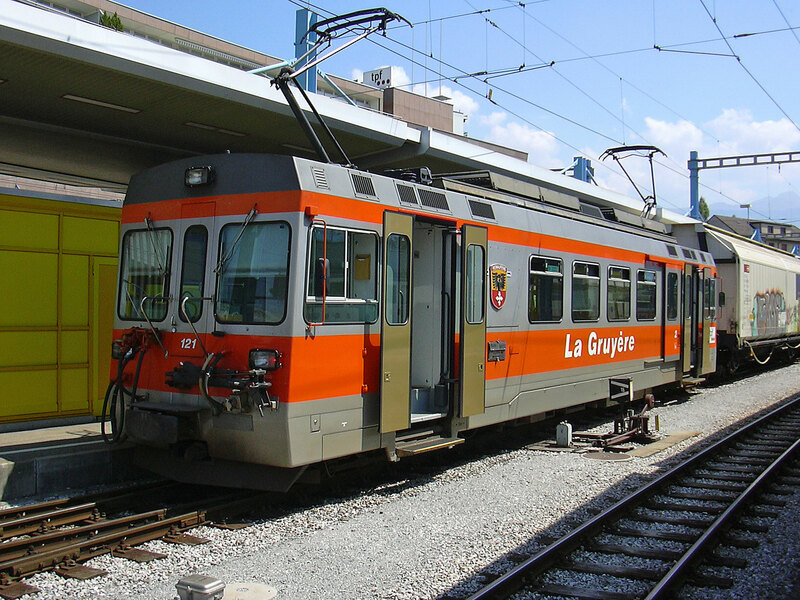 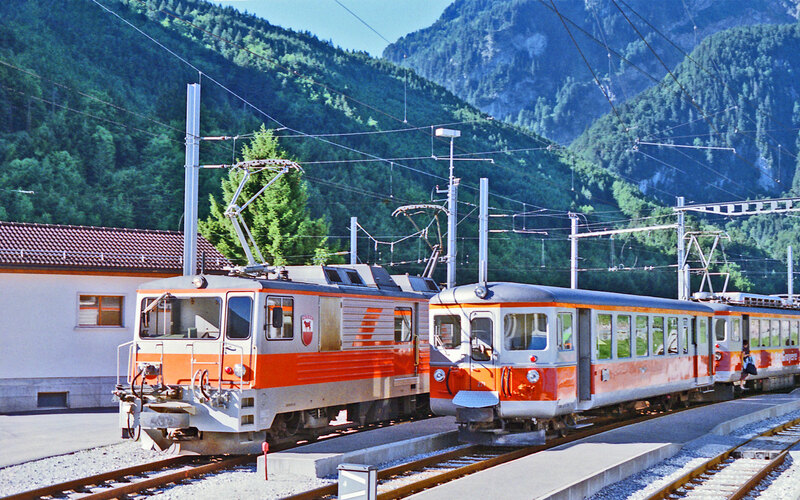 GFM/TPF Nos.121-124 were built in 1992/1995 by the ACMV, Vevey, with electrical equipment by ABB. 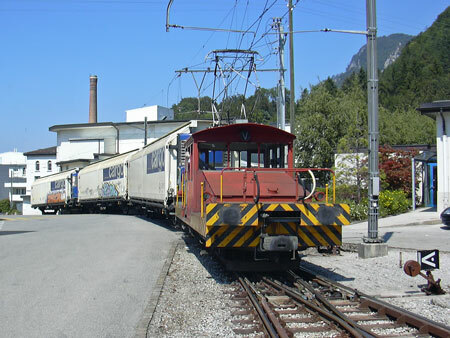 They are double-ended railcars with matching trailers in the 220 series. GFM/TPF Nos.141-142 were built in 1972 by SWP, with electrical equipment by SAAS. 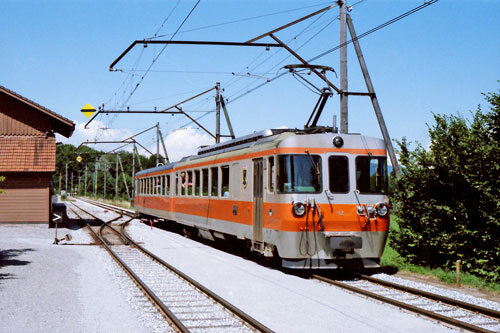 They are double-ended railcars. 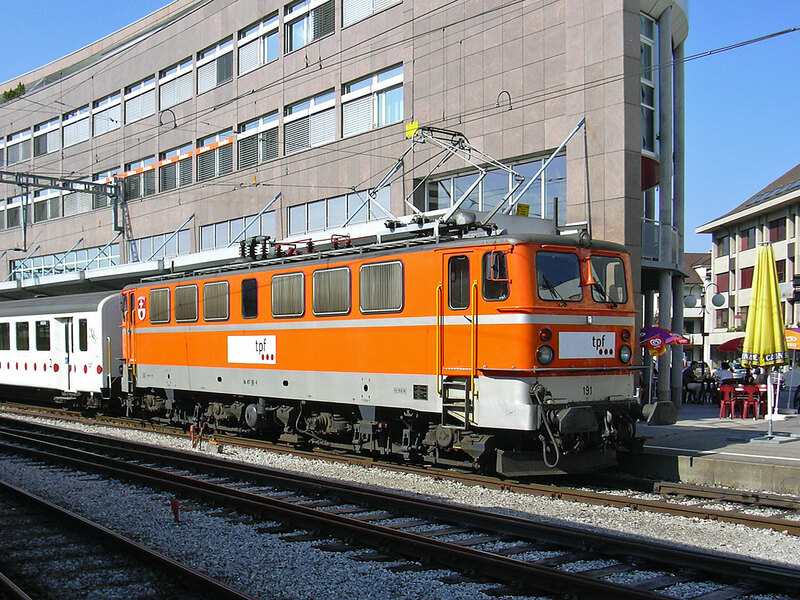 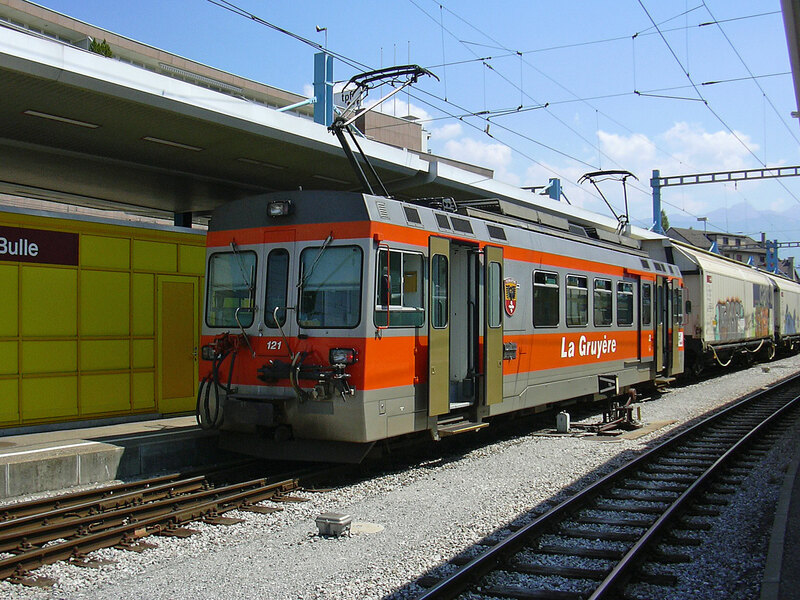 GFM/TPF Nos.151-152 were built in 1992 by SIG, with electrical equipment by SAAS. They are double-ended railcars. 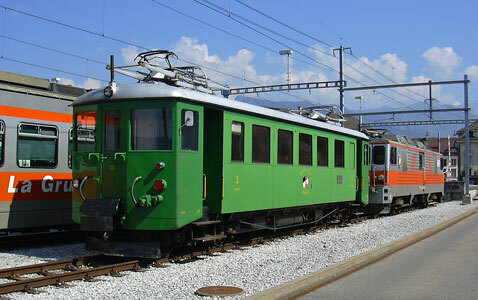 Matching driving trailers 251-252 are single-ended. GFM/TPF No.837 084-3 was built in 1963 by KRUPP/MAN and was being used at Bulle for shunting wagons. 084 worked at Deutsche Shell, Ingolstadt until 1983. 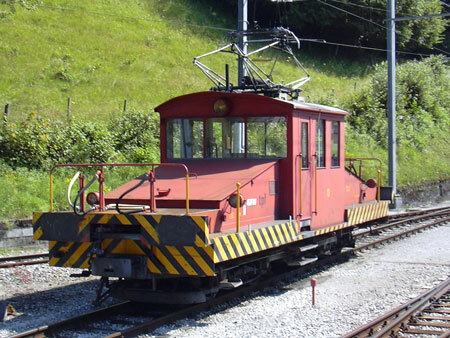 GFM/TPF No.91 was built in 1960 by SIG/BBC and was being used at Bulle for shunting. In 1960, a new prototype Bo-Bo electric locomotive was built for the East German Deutsche Reichsbahn (DR). 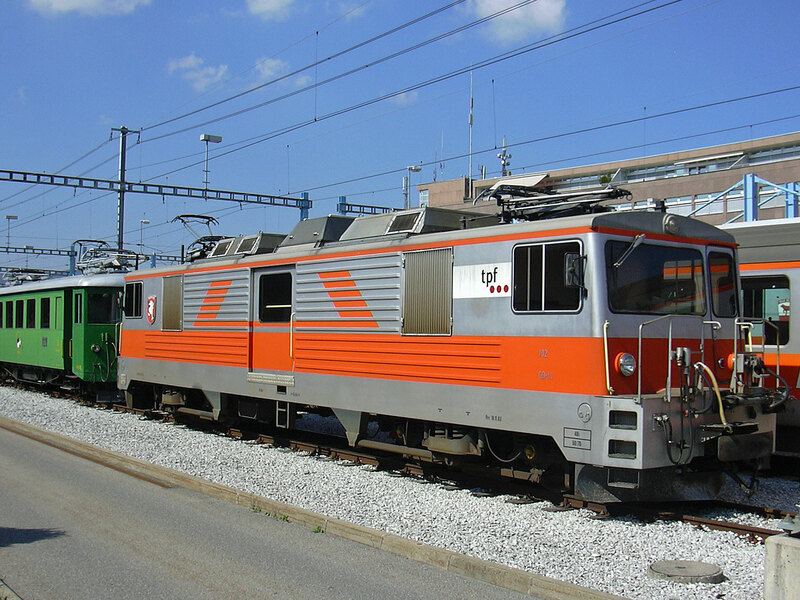 It was numbered E11 001, and production versions appeared from 1962. A lower geared version the E42 was also developed, more suitable for freight operations. 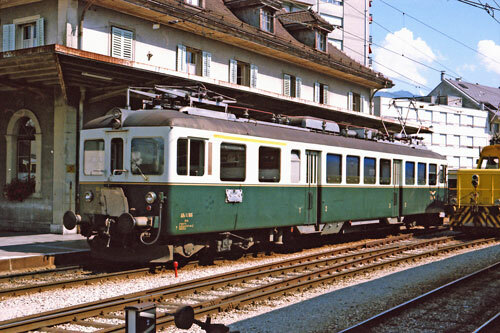 292 of these E42 locos were built (plus 96 of the higher speed E11). 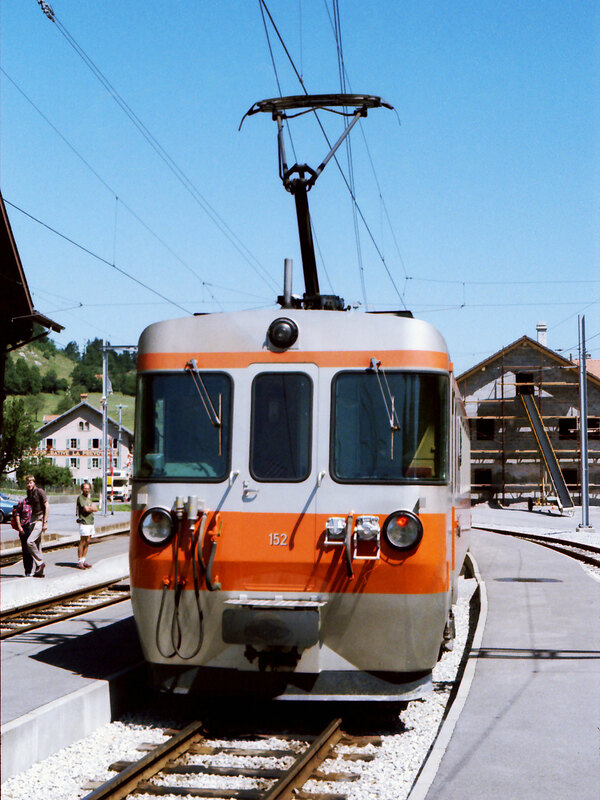 The class was later re-designated by DR as E242. 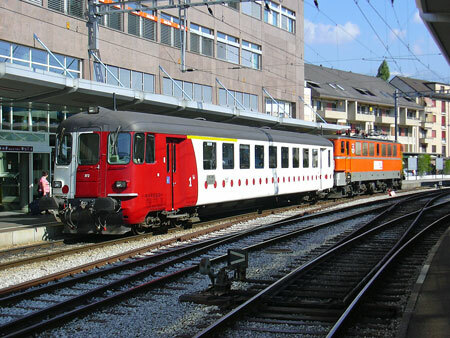 When DR was merged with the West German DB, the class became 142. 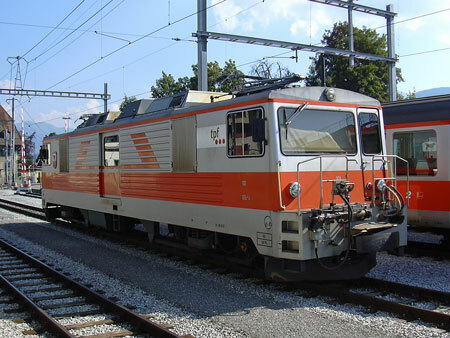 They were simple reliable locomotives that operated throughout the electrified East German system, but withdrawals started in the 1990s. A Swiss company Lokoop AG acquired 13 Class 142 locos and had them overhauled and modified for Swiss use at the Samstagern works of the Südostbahn (SOB) and by the Stadler company in Bussnang, Canton Thurgau. They were allocated class Ae476 in the Swiss system and operated in the north east of the country under hire. In March 1995, two of the class were sold outright to the GFM, where they became class Ae417 numbers 191 and 192. 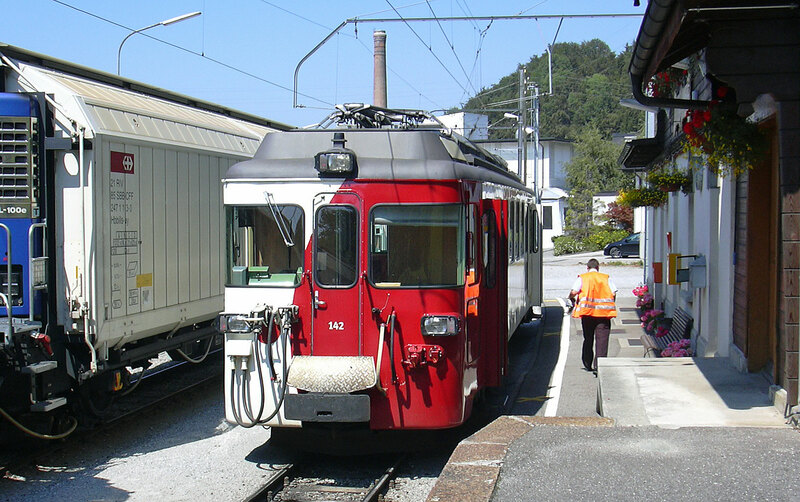 Their previous DB numbers were 142 110 and 142 145. 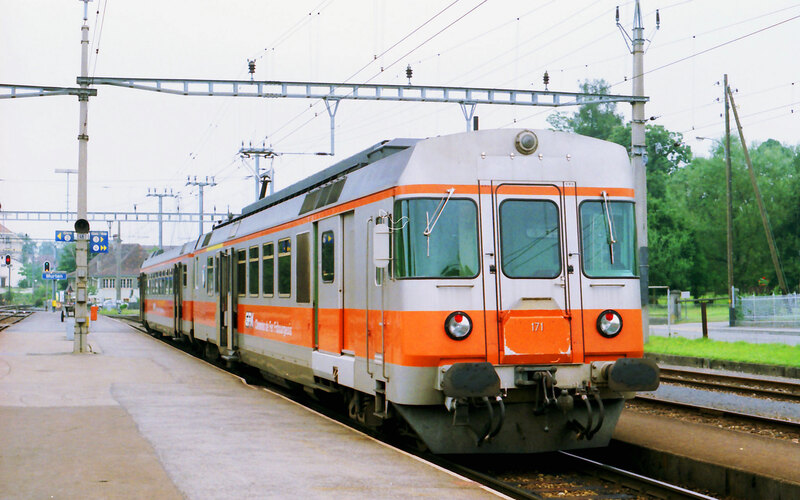 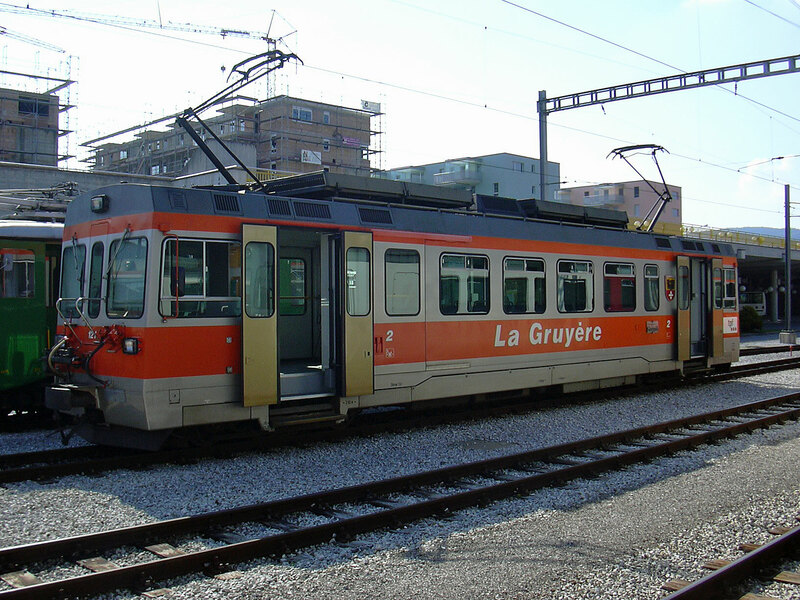 They were used by the GFM for freight trains and for push-pull passenger services, receiving the GFM orange/grey livery. 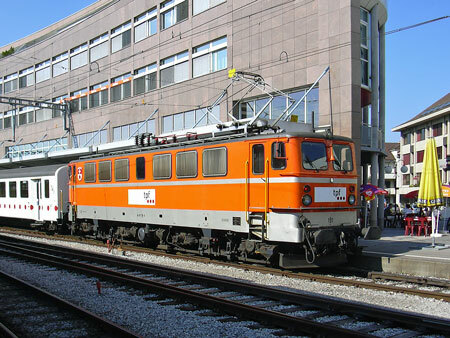 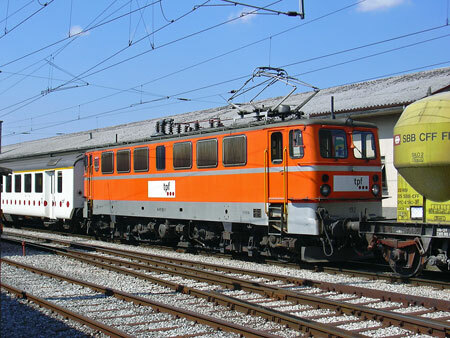 They were stored in 2005 when GFM/TPF freight services were taken over by SBB, and sold in2006. GFM/TPF No.161-167 were built in 1946-48 by SIG/BBC and were used on the standard gauge lines Bulle-Romont and Fribourg-Ins. 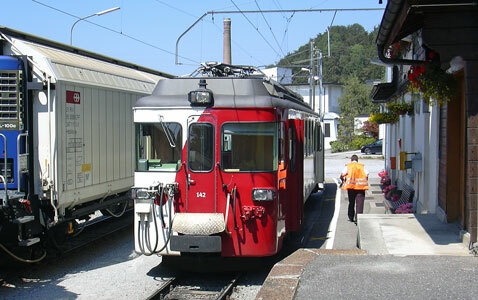 Only 161 was still listed as in stock in 2009. 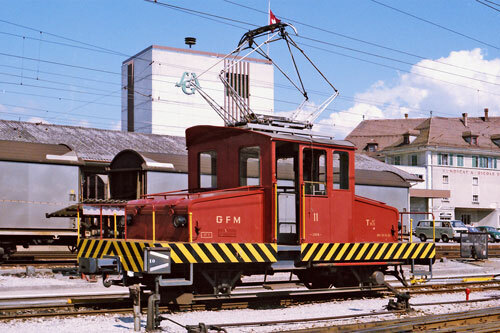 GFM/TPF No.171-173 were built in 19838 by SIG/SWS/BBC and were used on the standard gauge lines Bulle-Romont and Fribourg-Ins. 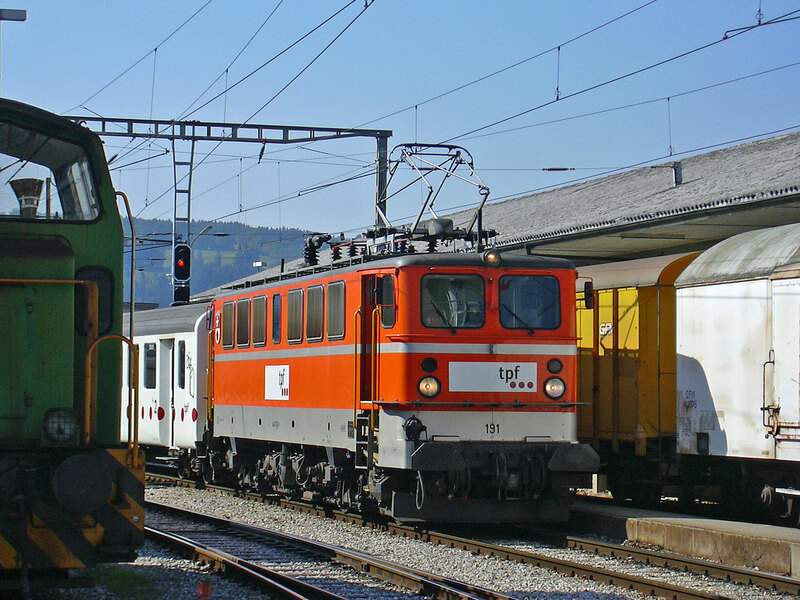 Nos.181/182 are similar.